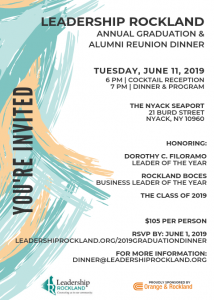 Leadership Rockland is the opportunity to help build a better you and a better Rockland County. The program engages and challenges participants to examine issues and seek solutions. You’ll participate in interactive discussions and activities with leading experts during 11 classes over 10 months. gain insight and understanding of the many facets that make up Rockland County. be part of an experience shared by leaders from business, government, not-for-profit and various other sectors. share a common bond with over 600 similarly situated leaders who have participated in a program over the past 25 years. explore what makes our county tick, and participate in frank discussions and activities with the top experts in their fields. There is no other way to gain so much exposure to a wide breadth of topics that cover much of what makes Rockland the unique county that it is. Interested in learning more? Contact us or apply for Leadership Rockland today. Applications are due April 1st for the following September’s program year.